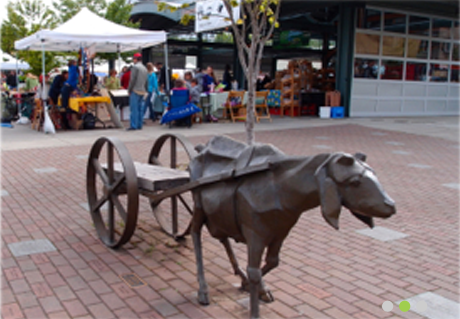 Our flagship Saturday Market operates at Depot Market Square in downtown Bellingham from 10am to 3pm every Saturday from April through December and also the third Saturdays of January, February and March. It is a perennial favorite with locals and tourists alike. This vibrant Market is known for attracting large crowds to shop the 100 vendors that sell local produce and goods. This Market also offers special events such as our Chef in the Market series which showcases local chefs demonstrating their favorite recipes using market-fresh products. Downtown Bellingham on Railroad at Chestnut From I-5 Northbound take exit 253 heading towards Lakeway Dr. Turn right on King St. Turn right onto Lakeway Dr. Take slight right onto East Holly St. Take left onto Railroad Ave. Market is at end of Railroad Ave. Look for parking along Railroad Ave.
From I-5 Southbound take exit 253. Turn right onto Lakeway Dr. Take slight right onto East Holly St. Take left onto Railroad Ave. Market is at end of Railroad Ave. Look for parking along Railroad Ave.
Free parking is available downtown at the Parkade at 1300 Commercial Street. The Market is located across the street to the east of the garage. There is Handicapped parking on 1100 Railroad Avenue, adjacent to market.